We need Pros for Half Day with a Pro – Register Today! 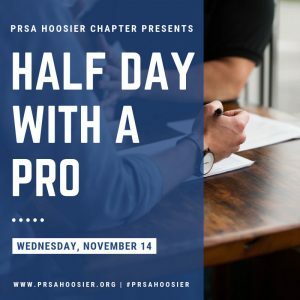 On behalf of the PRSA Hoosier Chapter’s PRSSA Committee, we would like you to consider signing up to host one or more students for Half Day with a Pro, scheduled for Wednesday, Nov. 14. The goal of this event is to provide PRSSA students the opportunity to learn from PR professionals at agencies, nonprofits and corporate offices, as well as provide them with professional development and the chance to network with Hoosier Chapter members. Immediately following Half Day with a Pro, we’d love for hosts to attend the November PRSA Hoosier Chapter Luncheon at the Indiana Landmark and network with students that participated in the program. Sign up by clicking here before Friday, Oct. 19. Questions? Contact the PRSSA Committee at prssa@prsahoosier.org. We would also like to ask for your help in recruiting students for Half Day with a Pro. If you know of an undergraduate or graduate student that would be interested in this event, please copy and paste this link –> http://bit.ly/StudentHalfDaywithaPro and send it to them. And, we’re also accepting scholarship applications through October 31. Please forward this link http://bit.ly/2DrmoiU to apply as well.